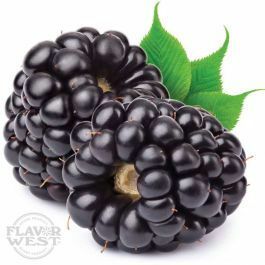 Blackberry flavor brings a perfect balance of fruity sweetness to your favorite drinks or treats. The aroma and sweet taste leave you arching for more. Type: Blackberry Water Soluble Flavoring. Ingredients: Natural and Artificial Flavoring, Propylene Glycol and Ethanol. USP Kosher Grade Flavoring. Usage Rate: 15-20% for E-use. Flavor suitability: Desserts, pastries, yogurt, ice cream, drinks and beverages, candies and more. Specific Gravity: 1.04 No Refunds on Flavoring. In my opinion this is one of their best fruit or berry flavors. Very realistic, not too tart and not too sweet. Well balanced. In my opinion this one of their best berry or fruit flavors. Not too tart nor too sweet. Very realistic and well balanced. I haven't had this flavor long but it has quickly become my favorite berry flavor. I am excited about the possibilities with this one.